During the seven years they were together, The Format released two amazing albums, and a number of EPs; after the band split up in 2008, Same Means and Nate Ruess went their separate ways. We all know what happened with Nate Ruess’s music career, but what about Same Means’? Here’s a look at what he has been up to in the last 4 years. Based out of Phoenix, AX Sam Means has taken on being a solo musician and self-released his soundtrack to '09's indie-comedy, The Sinking of Santa Isabel. He has also entered the world of licensing, having his song, 'Yeah Yeah', featured in many television advertising campaigns world-wide, including AT&T & McDonald's. 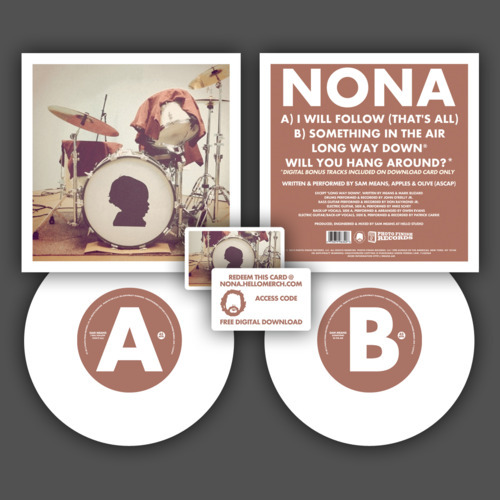 Last year he built a small studio in the warehouse of his company, Hello Merch, where he completed his first true solo effort, NONA, a four song 7" Vinyl/Digital EP, which will be released on Record Store Day, April 21st 2012 via Photo Finish Records (available on iTunes and everywhere else May 1st). You can pre-order and look at his other music on his website. My Dad and I used to go on these road trips to Oklahoma to visit family and he would buy a bunch of cassette tapes to listen to in the car. We would play each one over and over and I would always come home a new fan of some band or musician and even more interested in songwriting.. The Beatles definitely had a huge impact on me.. Once I hit 12 or so, my Dad bought a Beatles guitar book and let me practice on his old Martin acoustic.. As soon as I realized I could actually play a song all the way through, I knew it was something I wanted to stick with. It also helped having an uncle who is a great guitar player. He definitely taught me a lot along the way. I have to say it’s very inspirational how you keep pursuing being a musician after all these years. Before you started doing your solo music career, you were in The Format for seven years, and you also had a couple other musical outlets. What inspires and motivates you to still pursue a career in music? I just love creativity in all things. I'm lucky enough to have made a career out of doing what I love, so I hope to continue doing so in some capacity as long as possible. You self-released your soundtrack to 2009's indie-comedy, The Sinking of Santa Isabel. Is there a difference on writing music for a soundtrack vs. writing for your solo music? I pretty much had free reign with ’Santa Isabel’, so there wasn't much difference with that. I just had to write a bunch of tiny parts instead of a handful of full songs. It was definitely just as satisfying for me. The last movie I worked on, the guys really had their own vision for each scene… so following some of their guidelines ended up being a little difficult to get used to at first, but it's really not much different than being in a band with someone. What song of yours holds the most meaning to you? Why? A new one called, "Will You Hang Around?" - To me, it's about living and dying.. and really wanting to be perfect for the people you love, but coming to the realization that's never going to happen. I know a lot of people who hold, either, The Format’s ‘Interventions + Lullabies’ or ‘Dog Problems’ to be one of their favorite albums/ albums that changed their lives. What album(s) that have done that for you? There are so many for each stage of my life, but most definitely The White Album by The Beatles, Pinkerton by Weezer and everything Harry Nilsson has ever done. Besides being a musician, you also own your own company Hello Merch. Can you tell us a little bit about it and how you decided to start it? We (The Format and our good friend, Nate Burry) used to run our own merch store and always thought it would be great to take on other bands, because a lot of our friends were stuck in terrible situations and there seemed to be huge need for a merch safe haven.. It never materialized then because we were too busy with the band, but when I suddenly had a lot of free time on my hands, I decided to finally bring that idea to life and started Hello Merch. In 2011 you build a small studio, in your company’s warehouse, and completed your first true solo effort ‘NONA’ EP. I bet that was a truly magnificent experience, what were/ are your feeling towards this whole process? It was amazing and scary. I immediately loved having a place to go with all the tools and instruments to make something happen, but with that came absolutely no excuse to just sit around and talk about it. I got to work pretty quickly, but with Hello Merch and my family life, actually putting something out took longer than I had originally hoped. I'm not really sure. I try not to over analyze where anything comes from. Most of my songs start out as some nonsensical ramblings… then... kind of stay that way. Your song ‘Yeah, Yeah’ has been featured in numerous television commercials worldwide. What was it like, at first, hearing your songs being played on TV? Most of the commercials have been overseas, so it's kind of weird not being able to experience it first-hand, but when I did finally get one in the US… the first few times, I just sort of laughed about it… like, this is the weirdest thing ever. Then after seeing it a couple hundred times, the excitement wears off and you just want American Pickers to come back on. I hate sounding so cliché all the time with this, but really The Beatles, The Kinks, Harry Nilsson.. Even though I'll never amount to 1% of their talent, it's always fun trying. Who do you think changed the music industry? Why? If you could put a single face on the Internet, they would be largely responsible. But it's also just a different time. Things change everywhere. There's no way to stop progression in anything. Does being in a band make you appreciate music/talent more than if you weren’t in a band? No, I don't think so. I think there are plenty of music fans out there who probably appreciate it more than I do. As a musician, you can get a little desensitized to its power sometimes. I'll never see a concert again, the same way the 15 year old kid next to me is.. I'll probably never hear my favorite record again for the first time. There's so much to appreciate as a fan, especially a young fan of music. How do you think being a musician now, in this age of social media, differs from before? I think it's a lot easier to put yourself out to the world, but your life can be so short-lived too. Having a number one song 10 years ago meant a whole lot more than it does now. It seems to be so much harder to sustain these days.. no one has the attention span for it anymore. Lastly, if the world were to really end in December, what would you be most proud of as a musician? I'm proud of everything. ..even being in a band called "Nevergonnascore" 15 years ago. I can't believe how fortunate I've been to be able to experience what I have.